Sorry for the posting lull. I was, sadly, beginning to think I’d left my cooking karma back in 2009. First I suffered through the “mocha meringue massacre“. Then, I made granola, and it bit the turned to dust. (Why, oh why, does my granola not clump!?) So, I was a bit wary of having a third strike. But then I made oatmeal buttermilk bread. Instead of striking out, I hit a home run. This is the ultimate sandwich loaf – tasty for toast for Tim’s breakfast, perfect for PBJ’s for the girls to take in their lunch boxes, and the choice for cheese toast for my lunch. As if the smell of homemade bread emanating from the oven wasn’t enough, my eight-year-old’s first request upon recovering from a 3 day illness during which she ate nothing was this bread. Turns out cooking and baking in 2010 is gonna be ok after all. 1. Soak: Put the oats in the mixing bowl of a stand mixer. Pour in the water and mix briefly to wet all the oats. Let soften for 15-20 minutes. 3. 1st Rise: Lightly oil a big bowl. Transfer the dough to the bowl and roll it around to coat it with oil. Cover the bowl with plastic wrap. Let sit in warm, draft-free place for one hour*. 4. Fold: No, I’m not talking about laundry. Here’s how to fold bread: First, flour your work surface. Next, turn out your dough onto the work surface and work into a rectangle. 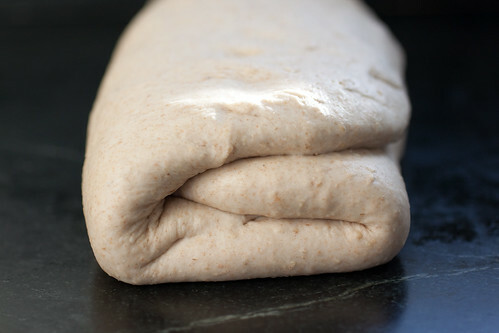 Now take one side, say the right side, and lift up about one-third of the bulk and then it onto the body of the dough. With spread fingers, use both hands to press down on the dough to degas it. Then take about one-third of the dough from the left side and fold it in toward center, overlapping the first fold. (Congrats – you’ve now made a trifold wallet of dough!) Again, press to degas. 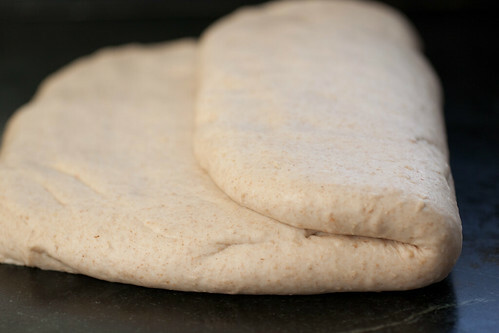 Be sure, prior to each folding, that any raw flour on the top surface of the dough (from the workspace) is brushed away. Now, reach over to the far side of the dough, bring about one-third toward you, and fold this portion. Finish by taking the dough closest to you and folding that portion away from you and into the center. When this 4th side has been folded, turn the dough over, pick it up, and place it back into the bowl. 5. 2nd Rise: Cover and let rise again for one hour*, or until doubled. Sometimes it can be hard to tell when it’s fully doubled in volume. Do the belly button test: poke the puffy dough ball gently with 2 fingers – if the indention (aka belly button) remains, you’re good to go. If not, let it rise a bit longer. 6. Divide: If you have large loaf pans, such as 10×5×3” pans, divide the dough into 2 equal pieces, about 2 pounds each. If your pans are a bit smaller, say 8×4×2½”;, divide the dough into 3 pieces, each weighing about 22 ounces. If you prefer freestanding loaves, you can divide them into any weight/size and bake them directly on a baking stone. Rolls weighing about 3 ounces each can also be made. Divide into desired weights and preshape the dough lightly into rounds. Place the dough pieces on a lightly floured work surface with seams facing up. Cover the rounds with plastic and let rest for 10-15 minutes. 7. Shape: Once the dough has relaxed, shape the dough. To form loaves, press the dough by hand into a rectangle about ¾” thick, 6” wide, and 8-10” long. Working from the short side of the dough, roll up the length of the dough. Pinch the final seam closed with the back of your hands or your thumbs and turn the ends under. For a nice finish, mist the surface with water and gently roll in a tray of oatmeal. Place the loaves into lightly oiled loaf pans and press gently so that the ends of the loaves touch the ends of the pan to ensure an even rise. 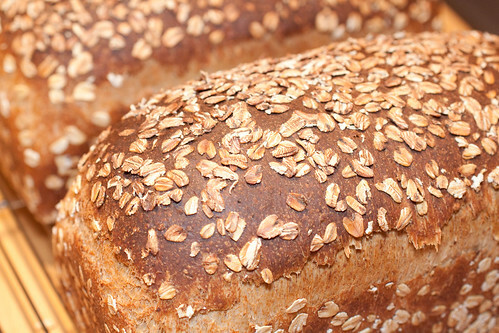 Cover the loaves with plastic so air currents don’t crust the surface and dry it out. 8. Final Fermentation: Proof for 1-1½ hours* (or more – once it took 3 hours! ), or until the dough crests above lip of the pan. 9. Preheat: Preheat oven to 460°F with oven rack on the middle shelf. 10. Bake: Bake at 460°F for 15 minutes. The buttermilk, honey, and oil make the bread brown quickly, so lower the temperature to 430°F after 15 minutes to finish baking in a receding oven. Bake for an additional 15-25 minutes. 22-ounce loaves baked in loaf pans will take a total of 30-32 minutes to bake, while loaves in the larger pans will take a total of 36-40 minutes. Bread is done when it registers 190-195°F in the center, is dark golden brown on the top and the sides, and sounds hollow when thumped on the bottom. 11. Cool: Cool in pans on wire rack for 10 minutes. Turn out and cool on wire rack for at least 1 hour before slicing and eating. (Warning: this may just be the longest 60 minutes of your life!) I usually wrap one loaf tightly in a double layer of foil and freeze to enjoy later. *A note about rising times: These times are merely guidelines. Exactly how long it will take depends on your kitchen temperature, humidity, etc. Please watch the bread, not the clock! 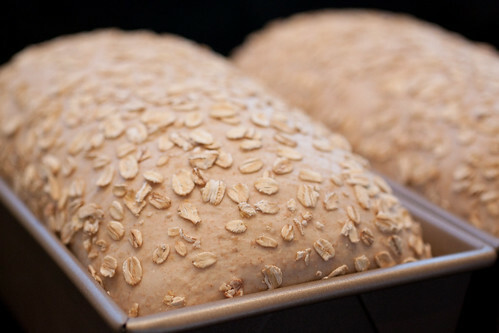 9 Responses to "Oatmeal Buttermilk Bread"
Thanks so much for sharing! I want to make this. It looks perfect. Your loaves look lovely – a home run for sure! Every recipe I’ve tried from Hamelman’s Bread has been a winner. Just made this bread today and it has got to be one of the best bread recipes I’ve ever used! This is an absolutely gorgeous loaf of bread. Great instructions and pictures. I’ll definitely have to try this soon. I made this (yummy!) but it came out super dense. I don’t know if its just because it is wheat or if I missed a step with the yeast. Was I supposed to do something extra, like soak it in warm water before incorporating it into the mixture? MR – Sorry to hear that your loaf came out dense. 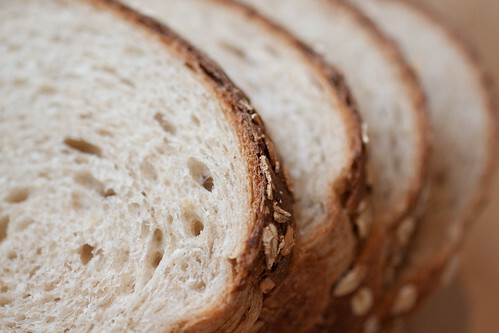 Using bread or high-gluten flour for the white flour in this recipe is important because it lifts the heavy oats and honey and ensures a light texture. 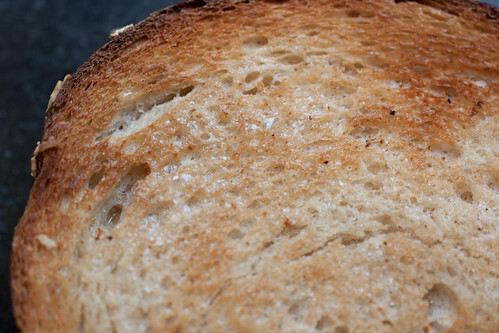 Trust me – this bread has a light texture or my kids wouldn’t eat it! When using instant yeast (such as SAF), there’s no need to bloom it. Heavy bread can be caused by using too much flour (I strongly recommend using a kitchen scale and weighing flour) or not letting it rise long enough. The rising times are just guidelines – watch the bread, not the clock. For the 2nd rise, sometimes it can be hard to tell when it’s fully doubled in volume. Do the belly button test: poke the puffy dough ball gently with 2 fingers – if the indention (aka belly button) remains, you’re good to go. If not, let it rise a bit longer. For the final fermentation, the loaf should crest above the lip of the pan – which has taken anywhere from 1 – 3 hours, depending on my kitchen temperature, humidity, etc. Good luck! Please let me know if you try it again, which I hope you do. My loaf is resting comfortably in it’s second rise! I cut the recipe in half to just make one loaf. For the future, if you only want to bake one loaf at a time, can the rest of the divided dough be frozen or be kept in the fridge until ready to be used? 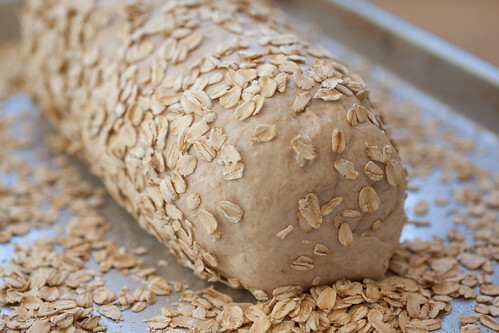 Hi Amanda – How did your loaf turn out? I always make a full recipe and freeze the extra loaf (fully baked). Hamelman notes that this dough lends itself well to bulk fermentation: After mixing, let the dough rise at room temperature for 30-60 minutes. Then degas, cover, and refrigerate overnight. The next day it’s ready to be divided, shaped, proofed, and baked at your convenience. This method gives you more flavor and more flexibility – a win, win! What happens if the buttermilk is low fat???? ?